Welcome to Fun 4 Ocala Kids, your ultimate resource for finding all the local family programs, events and more fun in the Ocala, FL area! Ocala has SO much to offer for children, young and old, but much of it is not advertised, and many activities and businesses may not have a website. That's where we come in. We love finding everything there is to do with your family and putting it all in one place so you never miss another fun family event of class again! We are local moms who enjoy staying busy with our kids and love the Fun 4 US Kids concept. Having one place to find all of the events and activities for children is very appealing so we set forth on the exciting venture to create Fun 4 Ocala Kids and provide this much needed resource to other local parents. Our friendships were forged through being parents; either meeting through playgroups or events involving family, birth and children. We love meeting new moms, dads, grandparents and caregivers in our community. We believe that through supporting local businesses, we can all succeed and continue to support our local community of Ocala and all it has to offer. If you know a local business or program in Marion County, add a business or program to our directory. 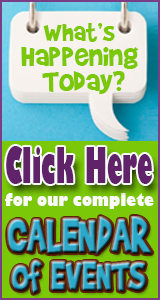 If you know about a great activity or event in Marion County, add an event or activity to our calendar.